Here is a collection of the words for some songs and rhymes that coordinate with the popular early childhood theme Kwanzaa, and can be used when planning activities and curriculum for Preschool, PreK and Kindergarten children. The holiday is filled with light. Kwanzaa's here and there's lots to do. 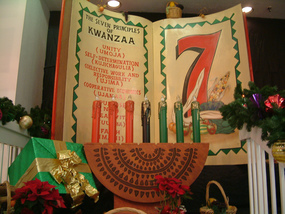 Kwanzaa's here and there's lots to see. Burning brightly as part of Kwanzaa lore. Kwanzaa has really come alive. Kwanzaa's here and there's food to fix. Now the glow of all the Kwanzaa candles reaches up to Heaven.